In 2009 the District recently re-opened the fire station at 4770 Horizonview Drive with two full time, paid firefighters, available on a 24/7 rotation. This is funded by a monthly assessment fee placed on all residential homes and commercial businesses. The First Responder Service charge is $25.07 per month. ISO plays an important role in the underwriting process for insurance companies. In fact, most U.S. insurers (including the largest ones) use ISO information as part of their decision when deciding to write coverage. 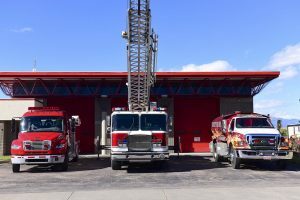 Fire stations are rated on a numerical scale of 1-10, one representing superior fire protection and ten representing an area which does not meet the minimum fire suppression standards. The ISO rating is important to communities and fire departments as it can lower insurance prices and provide fire departments with a valuable benchmark to help with planning. We are excited to announce that Colorado Centre Fire Department has an ISO rating of 02/2x. CCMD Water System: 3MG tank, 350 gpm water production and booster, 1200 gpm booster, Static pressure with CCMD 70 psi to 90 psi, smallest diameter line 8”, and fire hydrants are located one within 250’ and two within 400’ maximum of each property. Fire Engine Capabilities: 1250 GPM, 4 air protective devices, full complement of ladders, hoses and nozzles. Structure fire response to CCMD: 1 engine (2firefighters from CCMDFD), 1-1500 GPM engines and 1 ladder truck (12 firefighters from CSFD). Maximum Response Time: Less Than 4 Minutes!